Way back in 2000, I purchased a very cool computer case that was perfect for traveling. It was called "The Lapdog", and it held my laptop, computer cables, chargers, and PalmPilot. The neatest thing about it was you could unfold it and use it on your lap while in an airport. It was well-made and sturdy, and all the business people in the airport asked me about it! It was made by Shaun Jackson Designs. Fast forward a few years, and Shaun Jackson designs launches Higher Ground to bring cases to the education market. I have been a fan of Higher Ground technology cases since they first launched. They were one of the first companies that understood how important it was to offer cases that would protect student laptops as one-to-one programs were rolled out in schools. I purchased a few Higher Ground cases over the years, as they expanded their line of products to include tablet cases and sleeves. However, from day one to today, the common component throughout their product lines has been a hard-sided protection model that is both light-weight and functional. I remember, at ISTE 2011, everyone received either a Higher Ground iPad 2 sleeve or a 15" Higher Ground laptop sleeve in their registration bag. There was all kind of trading going on! I still have my laptop case and it now houses my Dell XPS15 laptop. Last week, Higher Ground sent me several cases that fit my current technology gadgets to review. It has been so much fun to explore their capabilities! Higher Ground currently has cases that fit in computer and tablet carts, cases that students can put in their backpack or carry separately, cases that allow students to use their devices while they are in the case, and traditional protective sleeves for devices. I will showcase what device(s) I will be using with the cases I received and provide a quick overview of the Higher Ground cases. I am always on the look-out for cases for my iPad Pro 12.9" tablet. The tablet is an odd size, but several cases from Higher Ground work perfectly for protecting it! This slim case will hold the device and, on the back, it has a handgrip at the bottom that students can use when carrying the case sideways. I also has a small pocket that can hold a small power supply or a cell phone. Another case Higher Ground sent me that works with the iPad Pro, my Macbook 12", and a Chromebook (it comes in 12" and 13" sizes), is the Flak Jacket Plus. This carry case has a sizable front pocket for carrying the adapters and accessories. A third item that will protect the iPad Pro 12", a Macbook, or a Chromebook is the new Higher Ground DropIn. The DropIn protects the mobile device when it is traveling in a backpack. It has a open top with a velcro strap, and allows easy access to the device. In addition, if students are carrying their books by hand, it simply feels like another book! The 11" DropIn fits a device up to 12" x 8.5" x 1.25". The DataKeeper is a case that allows the student to keep the 12" x 8.75" x 1.25" laptop in the case while they are using it. The laptop is held in place by slide-in front corners and elastic on the edges which help keep the case open and the laptop in the case while using the device. The outside has a pocket for pens, pencils, styli, and a cellphone. The Shuttle has been a staple in the Higher Ground line of products for a long time. This version, the Shuttle 2.1, comes in 11", 13" 14" and 15" sizes. 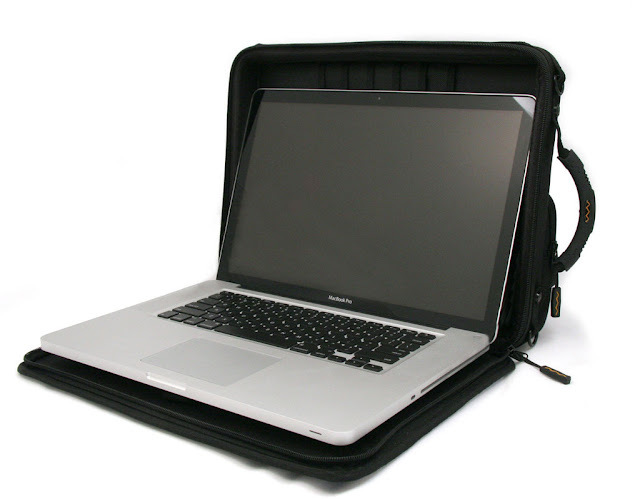 The case allows students to keep their laptop or Chromebook in the case while using it. It "floats" on sticky feet in the case, which also allows for air flow, and is held nicely in place with straps while traveling with the laptop. The back of the Shuttle 2.1 has a large slip pocket and the front has a zippered accessory pocket that can hold power adapters, flash drives, dongles, and more. The shoulder stray attaches so the case is in portrait orientation when being carried which makes it easier for students to keep from bumping others and their device. I own the 2014 version of the Dell 11" Chromebook. The Guardian is a new product that is a hard-sided shell with protective corners. It stays on the Chromebook, and can both fit in a cart of Chromebooks as well as protect the Chromebook if it is in a student backpack. To find out which Chromebooks this is available for, take a look the Guardian page on the Higher Ground site. Higher Ground also has a tech backpack, cases for iPads, the Nexus 7, and additional cases and sleeves to provide protection for teacher and student mobile devices and laptops. So, if you are planning a roll-out of a 1:1 program, want to protect the devices you have in rolling carts, or simply want a great case for your own device, take a look at the Higher Ground products!